Sundays 10:30am (9:30am july-Labor Day weekend, see calender). Wednesday services during Lent at 7:30pm preceded by Soup and Bread Suppers at 6:30pm. Communion served twice per month and holy days. Adult Sunday School, Sunday mornings at 9:15am. Confirmation is a 2 year program for 7th and 8th graders weekly on Mondays from 6:00pm to 7:30pm utilizing the Faith Incubators curriculum. Confirmation events are held as Learning, Service, or Fellowship events. 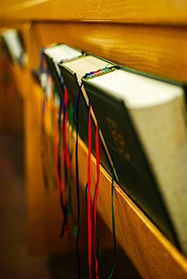 The rite of confirmation is held for 9th graders in October after 3 additional sessions typically held over the summer. Sunday School and Confirmation programs run from September through May and go on break over the summer. Adult Confirmation classes are offered as necessary, with two offerings in the last four years. It is offered as a 10 session program using a curriculum from Sola publishing.